Once-a-week workouts help career mom stay in shape. As a University of South Florida education professor working diligently to achieve tenure, Marie Byrd was already leading a hectic life when a divorce left her as the single parent of her five-year-old daughter some seven years ago. 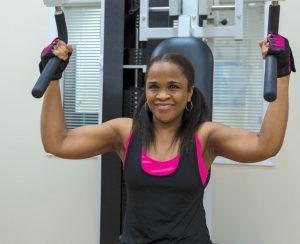 With work, writing and parenting already taking up a good deal of her time, Marie found it impossible, following the divorce, to carve out the six or eight hours a week she once devoted to keeping the fit, trim and toned appearance she likes. “Parenting and being in a tenure track, where you’re attending conferences away from home, researching and writing a lot, can be all-consuming,” explains Marie, now 53. “I was already very busy with work and everything else, and after the divorce, I became a little concerned that I might lose my physical self. “I purchased a treadmill for my home to help me stay in shape from a cardiovascular standpoint, but I wanted to find a gym where I could do strength training because a lot of professionals forget to take care of themselves physically as they climb the corporate ladder, and I didn’t want to do that. Marie’s desire to stay physically fit and strong prompted a search for a unique venue and/or training regimen that would allow her to achieve her goals in the limited amount of time she had to devote to the venture. It was during a search online that she found both in one place at 20 Minutes to Fitness. At 20 Minutes to Fitness, each client works out one-on-one with a nationally certified personal fitness coach who creates and supervises a detailed workout program. The program is designed to do exactly what the business’ name implies: achieve results through once-a-week sessions that last 20 minutes. The workouts are structured around an exercise method known as slow-cadence training in which the coach guides the client’s pace and form as weights are lifted in ultra-slow movements on highly specialized equipment. Repetitions during each workout last approximately 20 seconds, thereby maximizing muscle performance. The slow-paced movements that comprise each workout create continuous tension on the muscle fibers, which allows clients such as Marie to get more physical benefits from a 20-minute, once-a-week workout than they would get from a traditional workout program three or four times per week. Each 20-minute full-body workout consists of five to seven exercises, performed on specialized equipment for approximately two minutes. The goal is to reach what is known as peak performance, the point where blood flows to the muscle and supercharges the body. This helps burn fat while the muscles are rebuilt and strengthened naturally. The program has years of research and plenty of science behind its success. The highly specialized weight-training equipment is part of that success. The equipment features a patented double-stacking system, where weight can be increased in increments of two pounds instead of the traditional five, ten or 20. The equipment is also calibrated to work specific muscle groups without putting undue stress on joints or ligaments. Research has shown that in addition to improving strength, weekly, 20-minute, slow-cadence training sessions can also help improve balance, increase energy, control arthritis, increase bone density, fight symptoms of diabetes and reduce back pain. “We have clients who are planning to have hip or knee replacement surgeries, and their doctors have referred them to us because they know we can help them build up the muscle around those joints prior to surgery. This allows for a quicker recovery after surgery,” Angela adds. “We’ve had some people who have been able to hold off on those surgeries because they’ve built up the muscle around the joint. Most of our clients are people who want to stay fit but don’t have the time or don’t want to spend hours in a gym and possible risk of injury. “They want a safe, quiet, private studio environment, and that’s what we offer in addition to building back that muscle that people lose as they age. The other thing is, you’re never too young or too old to do this. Marie admits that at first, she was skeptical of the 20 Minutes to Fitness model. She had grown accustomed to traditional workout patterns and wondered if she could get the same benefits from a brief workout done once a week. After researching the program, however, she agreed the science behind it made sense and decided to give it a try. “I was sold after just one session!” she exclaims. “I remember that after my first twenty-minute workout, I was just as drained physically as I would have been after a one-hour session at a regular gym. I also liked that it was all very targeted, and the trainer is there monitoring everything the whole time. 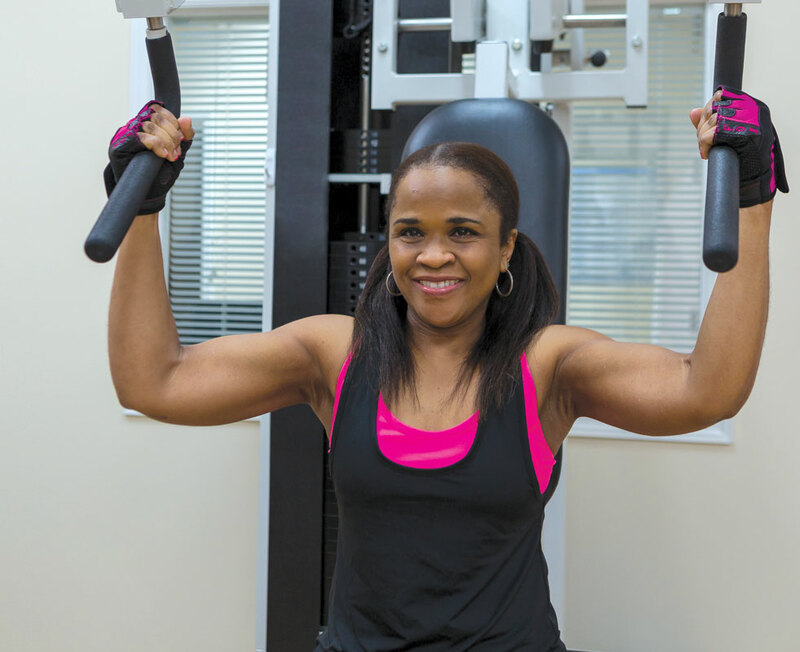 Marie was so impressed with the workout and the results that she has become a regular at 20 Minutes to Fitness. With a few exceptions, she has been completing her weekly 20-minute workouts for approximately six years now, usually under the guidance of personal trainer Eveline Grondin, whom Marie raves about. “Eveline knows me and knows how to push me,” Marie says. “If I’m struggling with the last two lifts or something like that, she’s always encouraging me, helping me to get that weight up, saying, You can do it, you can do it. She also has this great, little motivational statement she always uses to keep me going. Marie, who has indeed achieved her goal of having those strong shoulders and arms, also reports that her legs and core muscles are stronger than ever as a result of her 20-minute workouts. Her legs are so strong, she can run on her treadmill with the incline set at five. Meanwhile, her arms and core muscles are strong enough that she can drop and do 40 push-ups without tiring. It’s no wonder then that she has pushed other busy career moms to try the workout. “For people with a busy schedule who want to stay in great shape, 20 Minutes to Fitness is a definite must,” she says. “The workouts fit nicely into my schedule and have really helped me keep pace with my daughter, who has been into everything from soccer, basketball and volleyball to the piano and now band.